Geology: The Hale Formation is made up of two members: a lower Cane Hill Member and an upper Prairie Grove Member. The Cane Hill Member is typically composed of dark gray silty shale interbedded with siltstone and thin-bedded fine-grained sandstone. Some lithologies are locally calcareous. Isolated thick to massively bedded sandstones sometimes are present. Fossils are principally found associated with the calcareous units and include various mollusks, brachiopods and other groups. The lower contact of the Cane Hill Member marks the Mississippian-Pennsylvanian boundary in north Arkansas. An upper Mississippian age sequence mapped on the Geologic Map of Arkansas as the lower part of the Cane Hill Member of the Hale Formation in north-central Arkansas has been offered as a separate unit called the Imo Formation (Original reference: M. Gordon, Jr., 1964, U. S. Geol. Survey Prof. Paper 460, p. 34; Type locality: Sulphur Springs Hollow, SE, SE, Sec. 3 & NW, NW, Sec. 11, T13N, R17W; Searcy County, AR.). This sequence is a fossiliferous gray to black shale with some fine- to coarse-grained, phosphatic sandstone and conglomeratic limestone. Upper-most Mississippian age fossils are common in some intervals and include bivalves, gastropods, cephalopods, brachiopods, crinoids, trilobites, palynomorphs, plant material, and others. The upper boundary is poorly defined and may be a shale on shale contact while the base appears to be conformable with the Pitkin Limestone. The maximum thickness of this sequence cannot be determined without a clear definition of its contacts, but descriptions have indicated a range from 200 to 340 feet. The Prairie Grove Member is composed of thin to massive, often crossbedded, frequently pitted ("honeycomb weathering"), light-gray to dark-brown, limy sandstone or variously sandy limestone with lenses of relatively pure, crinoidal, highly fossiliferous limestone and oolitic limestone. Prairie Grove Member outcrops frequently have a mottled appearance when fresh. Fossils are common but generally fragmental. The fossil fauna includes: crinoids, bryozoans, brachiopods, algae, corals, trilobites, mollusks, and microfossils. The lower contact of the Prairie Grove is considered unconformable. The Hale Formation (Cane Hill Member) rests with pronounced unconformity upon older strata. The reported thickness of the Hale Formation ranges from a few feet to more than 300 feet. Original reference: G. I. Adams and E. O. Ulrich, 1905, U. S. Geol. Survey. Geol. Atlas, Folio 119. L. G. Henbest, 1953, Am. Assoc. Petroleum Geologists Bull., v. 37, no. 8. Witts Springs Formation (Lower Pennsylvanian, Morrowan) In 1964, Glick et al. gave this name to a sequence of rocks in the Snowball Quadrangle equivalent to the Prairie Grove Member of the Hale Formation and the entire Bloyd Shale (Formation) of the type Morrowan region, northwestern Arkansas. In their description of this unit they defined its upper limit as the base of the Atoka Formation which they identified as the first massive quartz pebble sandstone they encountered above the Witts Springs Formation. In 1975, the "middle Bloyd sandstone", which is not present in the type area in northwestern Arkansas, was identified and described as belonging in the Bloyd Formation in north-central Arkansas by Zachry and Haley. It is this sandstone to which Glick referred when defining the upper limit of the Witts Springs. Therefore, in current mapping, we have defined the upper limit of the Witts Springs Formation as the base of the "middle Bloyd sandstone" and divided it from the middle and upper Bloyd. The unit is underlain by and unconformable with the Cane Hill member of the Hale Formation. The Witts Springs Formation is equivalent to the Prairie Grove Member of the Hale Formation and the lower part of the Bloyd Formation (Braden, et al., 2003). Formation thickness ranges approximately 220 - 400 ft. (67 - 122 m). Main body - consists primarily of very thin to massive-bedded, very fine to medium-grained, sub-angular to rounded, often calcareous sandstone units with some interbedded shale and siltstone. These sandstone units can form good ledges, but more often form steep, covered slopes perhaps due to the calcareous cement quickly weathering out at the surface. The sandstones range from orange-brown to gray on fresh surfaces and weather gray to brown. Calcareous, fine to medium-grained, fossiliferous sandstone is present and may contain clay shale pebble clasts and fine to coarse quartz pebbles. Approximate thickness 180 â€“ 360 feet (55 â€“ 110 meters). Basal sandstone â€“ is a massive, blocky to concave-weathering, poorly to moderately well-sorted, subangular to subrounded, fine to medium-grained sandstone which is usually calcareous, especially where cross-bedded, and can be micaceous. It may also crop out as a thick stack of thin to medium-bedded, cross-bedded channel sands. Typically fresh surfaces are gray to gray-brown or tan and mottled with brown iron-oxide blebs which can form bands. It can be fossiliferous along bedding planes, or where weathered out, will exhibit external fossil molds. Also, it commonly contains shale pebbles or voids where pebbles have weathered out. In some areas, the sandstone has become decalcified resulting in a dark brown color and a "rotten" appearance. In some outcrops a lenticular, cross-bedded, fine to course-grained, sandstone conglomerate is present containing inclusions of rounded milky quartz pebbles, ironstone concretions, light-gray to light-brown shale pebbles, fossil fragments and sandstone pebbles. This conglomerate mostly occurs just above the lower contact, but can occur throughout the basal sandstone unit. 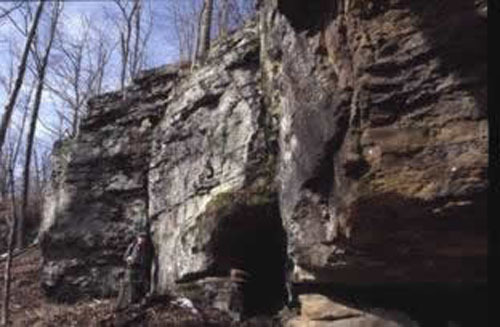 Long horizontal pits are visible in outcrop at some locations that resemble classic Prairie Grove weathering. In some places these intervals occur above the more blocky massive units. The sandstone can exhibit honeycomb weathering and precipitate travertine flowstones near the base due to leaching of the carbonate. The top is mostly indistinguishable from additional packages of massive sandstone in the main body above. Approximate thickness 40 - 80 feet (12 â€“ 24 meters). Cane Hill Member along Peyton Creek. Prairie Grove Member near Jasper, Newton County, Arkansas. Geology: The Bloyd Formation consists of (in ascending order): the Brentwood Limestone Member, the Woolsey Member, Dye Shale Member, Kessler Limestone Member, and the Trace Creek Shale Member, which is considered a part of the Atoka Formation by many recent workers. The Brentwood Limestone Member is a sequence of limestones separated by thick intervals of dark shale. The normal sequence usually has 2 to 4 limestone intervals; however, east of the type region the unit becomes more sandy. The Woolsey Member is composed of terrestrial sediments comprised of dark-gray, fissile shale, often interbedded with thin siltstones. 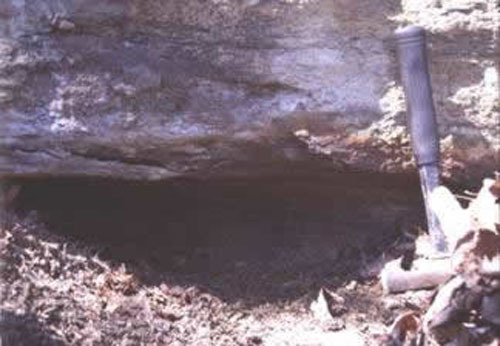 A thin coal bed, called the Baldwin Coal, occurs at or near the top of the Woolsey Member. East of Washington County, the Woolsey is replaced by a thick, fine- to medium-grained, cross-bedded sandstone facies commonly referred to as the Middle Bloyd Sandstone. This unit frequently contains quartz granules and is a common bluff-former. The Middle Bloyd Sandstone is normally mapped as part of the Dye Shale. 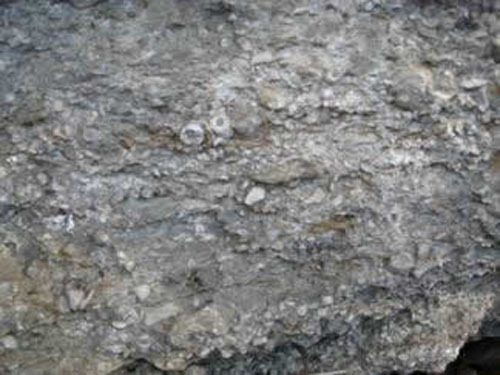 The marine deposited Dye Shale Member is predominantly a dark-gray shale with scattered calcareous concretions. Where underlain by the Woolsey Member, the Dye Shale frequently has a bed of calcareous sandstone with scattered clay pebbles and quartz granules, called the caprock, at its base. The Kessler Limestone Member is either a single unit of limestone or a sequence of limestone and shale interbedded. The limestones are bioclastic, oolitic, and contain abundant oncoliths, traces of clay-pebble conglomerate, and minor amounts of calcareous sandstone. The Kessler Member appears to be absent east of central Madison County. 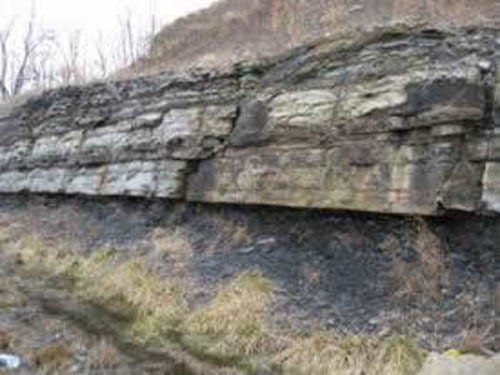 The Trace Creek Shale Member is composed of dark-gray shales with some thin beds of sandstone. The sandstone beds become thicker and more common toward the top of the unit. Fossils of most common invertebrate phyla are known mostly from the limestones and calcareous sandstones of the Bloyd Formation. The base of the formation is considered conformable, but unconformities are recognized at the base of the Dye Shale and at the base of the Trace Creek Member. Typical thicknesses for the Bloyd Formation range from 175 to 200 feet. Original reference: A. H. Purdue, 1907, U. S. Geol. Survey Geol. Atlas, Folio 154. Bloyd Formation (Lower Pennsylvanian, Morrowan) - In this quadrangle the individual members within the Bloyd Formation cannot be recognized because its limestone units (Brentwood and Kessler Limestones) are either missing or have become shaly and sandy. There are no other "marker zones" to divide the section into the recognizable members known from the type section in northwest Arkansas. Therefore the Bloyd Formation is divided informally into lower and upper parts (Hudson et al., 2001) separated by the "middle Bloyd sandstone" (Zachry and Haley, 1975). Approximately 480-760 ft. (144-233 m) thick. upper part - Consists of thin ripple-bedded to thick micaceous sandstones interbedded with clay to silty shales. The sandstones consist of fine to coarse-grained sub-angular to sub-rounded quartz. They are light- brown to gray on fresh surface but weather dark-gray. 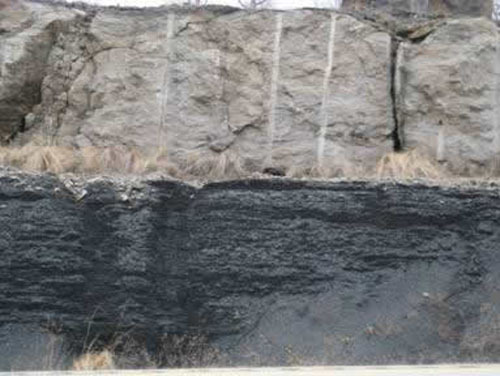 The shales are dark-gray to black on fresh and weathered surfaces. This interval contains many trace fossils and load features. Approximately 200 - 320 ft. (60 - 98 m) thick. "middle Bloyd sandstone" - A thin to massive, medium to coarse-grained, cross-bedded quartz or iron-cemented sandstone with sub-angular to sub-rounded quartz grains. Reddish, gray, or light-tan on fresh surfaces but weathers brown to orange-brown due to iron content. The cross-bedded packages can be up to three feet thick and occasionally "overturned". Contains abundant lycopod fossils and rounded quartz pebbles. This sandstone forms a prominent bluff throughout this quadrangle and separates the upper from the lower part of the Bloyd Formation. A pebble clast conglomerate is present at some localities at the base of this sandstone. In the southeastern corner of the quadrangle the "middle Bloyd sandstone" displays spheroidal weathering creating rounded columns. This along with a maze of enlarged joints creates an outcrop known as "Buzzards' Roost". Just across the drainage is a natural bridge known as "Rainbow Rock”. 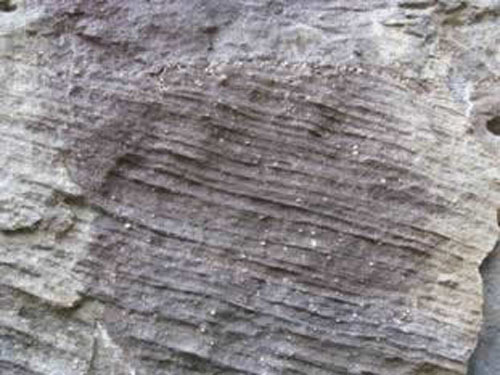 The "middle Bloyd sandstone" is unconformable with the lower part of the Bloyd Formation. Approximately 80-120 ft. (24-37 m) thick. lower part - Consists of interbedded very thin to thin ripple-bedded micaceous siltstones and sandstones that are fine to medium-grained interbedded with black clay to silty shales. Throughout the lower portion is black fissile clay to silty shales and thin sandstones interbedded with thin to thick-bedded fossiliferous carbonate to sandy carbonate layers. Thin pebble conglomerates are present within the interbedded shales and sandstones. The carbonate zones vary from red to gray on fresh and weathered surfaces and can be mottled. Sometimes the fossiliferous sandy zones look "rotten" due to decalcification. The quartz grains are medium-grained and sub-angular to sub-rounded. This unit contains abundant trace fossils and loading features. The contact between the lower part of the Bloyd Formation and the Prairie Grove is placed below a shaly layer conformable with the underlying massive calcareous sand of the Prairie Grove Member of the Hale Formation. Approximately 200-320 ft. (60-98 m) thick. In areas east of western Searcy County, the Bloyd/Hale contact becomes indistinguishable. 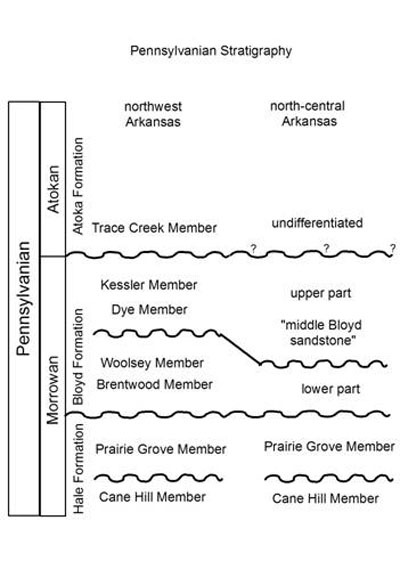 Since 2003, Braden, et al have mapped units equivalent to the Prairie Grove Member of the Hale Formation with units equivalent to the lower part of the Bloyd Formation. Together, these equivalent units are called the Witts Springs Formation. The following description is taken from the geologic map of the Witts Springs quadrangle (Smith and Hutto, 2007). Witts Springs Formation (Lower Pennsylvanian, Morrowan) In 1964, Glick et al. gave this name to a sequence of rocks in the Snowball Quadrangle equivalent to the Prairie Grove Member of the Hale Formation and the entire Bloyd Shale (Formation) of the type Morrowan region, northwestern Arkansas. In their description of this unit they defined its upper limit as the base of the Atoka Formation which they identified as the first massive quartz pebble sandstone they encountered above the Witts Springs Formation. 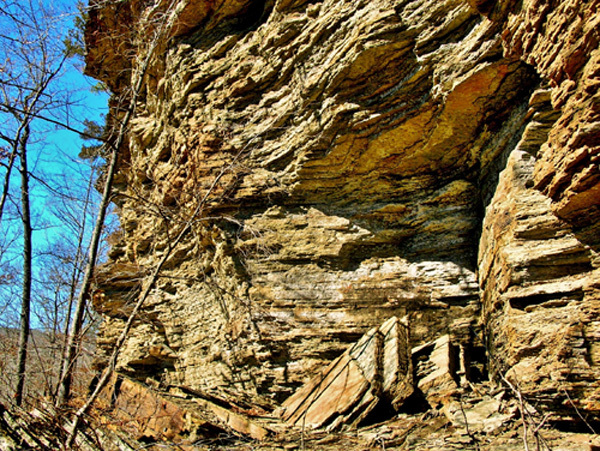 In 1975, the "middle Bloyd sandstone", which is not present in the type area in northwestern Arkansas, was identified and described as belonging in the Bloyd Formation in north-central Arkansas by Zachry and Haley. It is this sandstone to which Glick referred when defining the upper limit of the Witts Springs. Therefore, in current mapping, we have defined the upper limit of the Witts Springs Formation as the base of the "middle Bloyd sandstone" and divided it from the middle and upper Bloyd. The unit is underlain by and unconformable with the Cane Hill member of the Hale Formation. The Witts Springs Formation is equivalent to the Prairie Grove Member of the Hale Formation and the lower part of the Bloyd Formation (Braden, et al., 2003). Formation thickness ranges approximately 220 - 400 ft. (67 - 122 m). Main body - consists primarily of very thin to massive-bedded, very fine to medium-grained, sub-angular to rounded, often calcareous sandstone units with some interbedded shale and siltstone. These sandstone units can form good ledges, but more often form steep, covered slopes perhaps due to the calcareous cement quickly weathering out at the surface. The sandstones range from orange-brown to gray on fresh surfaces and weather gray to brown. Calcareous, fine to medium-grained, fossiliferous sandstone is present and may contain clay shale pebble clasts and fine to coarse quartz pebbles. Approximate thickness 180 â€“ 360 feet (55 â€“ 110 meters). 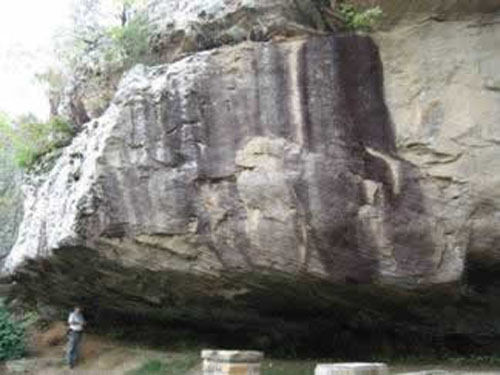 “middle Bloyd sandstone” south of Huntsville, Arkansas. Quartz pebbles and cross-bedding in the “middle Bloyd sandstone”. Typical bluff exposure of the “middle Bloyd sandstone” near Mt. Judea, Arkansas. 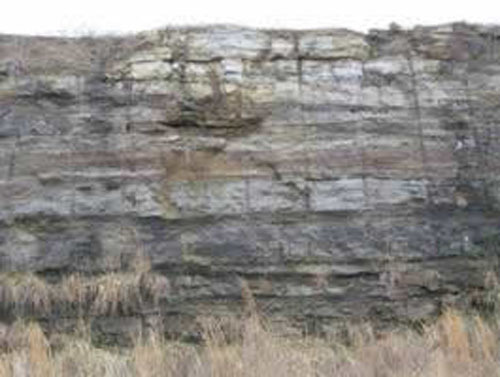 Geology: The Atoka Formation is a sequence of marine, mostly tan to gray, silty sandstones and grayish-black shales. Some rare calcareous beds and siliceous shales are known. This unit has the largest areal extent of any of the Paleozoic formations in the state. It is the surface rock of the Boston Mountains and dominates the exposures in the Arkansas River Valley and the frontal Ouachita Mountains. 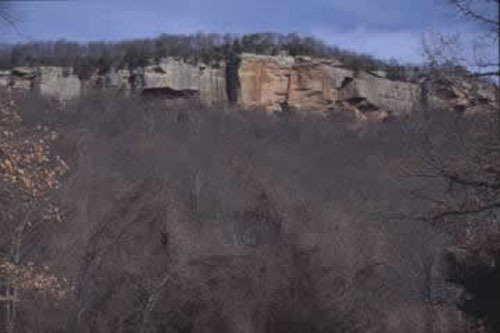 It is also present in the southern part of the Ouachita Mountains. In the Arkansas River Valley and the frontal Ouachita Mountains, the Atoka Formation has been subdivided into upper, middle, and lower lithic members based on regionally mappable shale or sandstone intervals. The unit locally contains discontinuous streaks of coal and coaly shale in the Boston Mountains and Arkansas River Valley. Fossil plants are common throughout the section, but are generally poorly preserved. Poorly preserved invertebrate fossils are much less common and are found at several horizons. Trace fossils are relatively common in the Atoka Formation. The formation is conformable with the Bloyd Shale in the Boston Mountains and the Johns Valley Shale in the Ouachita Mountains. The unit may attain a thickness of 25,000 feet in the Ouachita Mountains, although only largely incomplete sections are known. Original reference: J. A. Taff and G. I. Adams, 1900, U. S. Geol. Survey 21st Ann. Rept., pt. 2, p. 273. Atoka Formation (Middle Pennsylvanian, Atokan) - Consists of black to tan shales, interbedded with very thin to thin ripple-bedded micaceous siltstones, and thin to medium bedded, fine to very fine-grained sandstones with sub-angular to sub-rounded quartz grains. The sandstones are tan to buff colored on fresh and weathered surfaces and contain clay pebbles, liesegang bands, horizontal trace fossils, and cross-beds. Occasionally the sandstones contain pebble conglomerate zones with external molds of fossils. 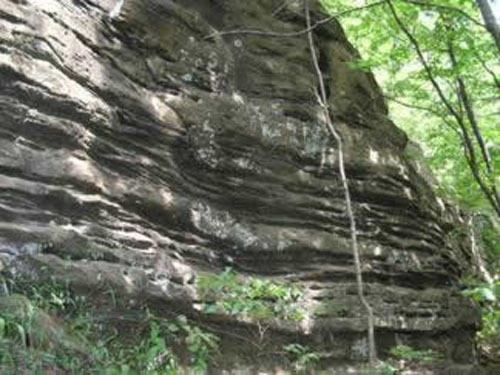 The sandstones vary from 10 - 20 ft. (3 - 6 m) thick. This contact is tentative and will be resolved with future mapping. Approximately 40 - 300 ft. (12 - 91 m) thick. Purdue, A. H. and Miser, H. D., 1916, Eureka Springs-Harrison Folio, Arkansas Missouri: U.S. Geological Survey Geologic Atlas of the United States, no. 202, 82 p.
Zachry, D.L., and Haley, B.R., 1975, Stratigraphic relationships between the Bloyd and Atoka Formations (Pennsylvanian) of northern Arkansas: in Contributions to geology of the Arkansas Ozarks, Arkansas Geological Commission Miscellaneous Publication 12, p. 96-106.